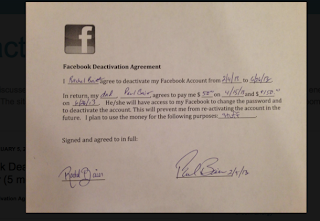 Covenant Relationships: The “Facebook Deactivation Agreement” An Example of Cosmopolitan Parenting? We all know that Facebook has its ups and downs. It's the perfect way to stay in touch with old friends and share life updates and photos with your family and even do business. But it also serves as a tremendous distraction. Some waste hours scrolling through Facebook's infinite pages, looking through photo upon photo, desperately waiting for a new, tiny red notification symbol to pop up in the top left corner of their screen. I wonder how many of our children are resting their laptops on top of their unopened textbooks right now? Some might say "If the man happened to be my dad, we would sign a life contract worth £1m and it would be bye-bye to Facebook case-closed!" Some might criticize the father for bribing his daughter or offering her financial motivation for responsible behavior, but this girl was a honors student (mostly straight As) and this was her idea. This is a great example of a daughter’s entrepreneurship, ingenuity and a great lesson learned in business. She had trouble finding employment, she came up with an idea her customer found appealing and she presented a proposal and he accepted it. I admire their very cosmopolitan approach (just check out that agreement). Her friends may shun her, she may suddenly be regarded as not "cool" at school or just feel a bit left out . This is enormous pressure on a 14 year old but she signed it. Not only was it a great way to bring a father and daughter closer together, but she learned about contracts, how you get payment up front and payment at the end of the contract for performance. It’s very much a win-win for both of them, and maybe even a lesson she can take with her to adulthood. That said, many of you who read the article teaching your children hard work and responsibility will remember what I said about understanding "intrinsic" versus "extrinsic" motivation. Intrinsic motivation is when people do things because they feel proud of themselves when they do it. They feel a sense of accomplishment and achievement. Extrinsic motivation is when someone does something because of external motivation. For example, they will receive money, a toy or privilege if they do the task. If you are always rewarding your child with material things, he/she will never learn how to motivate themselves with internal rewards like pride. They also will never learn to value things because there are so many things and nothing is special. So we have to know where to draw the line. Perhaps Rachel's case is just an example of Facebook fatigue, but I think we could all learn something from this. What do you think?